Cleveland Indians starter Corey Kluber shredded the Seattle Mariners last night, shutting them out over nine innings and striking out eight, and taking just 85 pitches to do it. It wasn't an aberration, either: Kluber has been spectacular all year, which is hard to believe considering that he was a fourth-round pick in the 2007 draft and didn't even break into the bigs until 2012. So how did a 28-year-old in what is essentially his first full season as a starter become one of the best pitchers in the game? The sinker is Kluber's bread-and-butter pitch—he's thrown it nearly 50 percent of the time this season—but it's the cutter and slider that do damage for him, because nobody can hit them. He throws the cutter 26 percent of the time, and batters are swinging and missing at 18 percent of those pitches. The slider is similarly devastating, eliciting empty swings from batters 22 percent of the time. 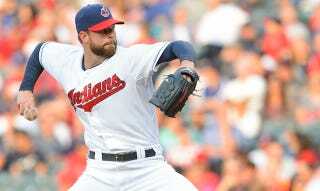 If you watched Kluber's surgical dismantling of the Mariners last night, you couldn't help but notice that slider. The thing flies through the strike zone like a goddamned frisbee, diving off the edge of the plate and making guys look stupid. It is, unquestionably, one of the best in the game. In 2012, it came with an average horizontal break of about seven inches. Kluber improved that to nine inches last season, and an average of 10.38 horizontal inches this year. That's a staggering number, and is the kind of break you usually only see on a curveball. Consider that Yu Darvish, who has a similarly slow-ish slider—Darvish's clocks in at 81 mph; Kluber's at 83 mph—gets an average horizontal break of 9.68 inches on his slider. This is how a guy goes from being a nobody to holding down a 2.50 ERA and striking out 170 guys in 158 innings. Kluber's success might be surprising, but the root of it is really quite easily explained. All Kluber has done since coming into the league is get demonstrably better in nearly every way imaginable—velocity, movement, and control. That's about as simple a method of finding success as there is.